The Kepler-18 system is one of the galaxy's busiest places, with two Neptune-sized planets and a super-Earth orbiting around a single star. We know this, thanks to a bold new exoplanet-hunting technique that could help us find more Earth-like planets. The planets are designated Kepler-18 b, c, and d. Planet b is the closest, completing an orbit every 3.5 days. The planet is a rocky super-Earth, weighing in at about seven times Earth's mass and twice our planet's size. Planets c and d are gas planets roughly the size of Neptune or Uranus. Planet c orbits every 7.6 days, it's 17 times more massive than Earth, and about 5.5 times our size. Finally, planet d is about 16 times more massive than Earth, 7 times our volume, and orbits every 14.9 days. That's a whole lot of planets to stick into such a tiny amount of space, and it's not as though Kepler-18 is anything unusual as far as stars go. It's broadly similar to our Sun, about 97% the mass and about 1.1 times our star's size. What's more, the planets are trapped in a bizarre pattern. Planets c and d appear to be in a 2:1 resonance pattern, where planet c revolves around Kepler-18 twice for every one orbit planet d completes. "[They] are not staying exactly on that orbital period. One is slightly early when the other one is slightly late, [then] both are on time at the same time, and then vice-versa. It means they're interacting with each other. When they are close to each other...they exchange energy, pull and tug on each other." 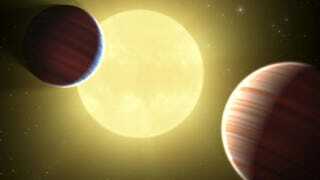 Kepler-18 also represents the first chance for astronomers to use a new exoplanet-hunting methodology. Generally speaking, planets are found by the transit method, which detects planet by looking for regular dips in the brightness of a star that could only be caused by an orbiting planet passing in front of it. While false positives are possible with this approach, the resonance patterns between planets c and d quickly proved their existence — only two planets that were really in the same solar system could produce such a pattern. But planet b is a trickier case, and it gave Cochran and his team a chance to try out the new approach of "validation", rather than "verification." What this means is they didn't set out to directly prove the existence of the planet; instead, they figured out the odds that this wasn't a planet. To do that, they used the Palomar 5-meter Hale Telescope to search the area around Kepler-18 for any objects that could mimic the signature of a transiting planet. "We successively went through every possible type of object that could be there. There are limits on the sort of objects that can be there at different distances from the star. There's a small possibility that [planet b] is due to a background object, but we're very confident that it's probably a planet." "We're trying to prepare the astronomical community and the public for the concept of validation. The goal of Kepler is to find an Earth-sized planet in the habitable zone [where life could arise], with a one-year orbit. Proving that such an object really is a planet is very difficult [with current technology]. When we find what looks to be a habitable Earth, we'll have to use a validation process, rather than a confirmation process. We're going to have to make statistical arguments." Those arguments would have seemed a lot shakier a few years ago, when only a relatively small number of exoplanets were known. But now that the Kepler mission has identified over a thousand exoplanet candidates, and current estimates suggest there are millions and millions of planets in our galaxy - if not billions - validation seems like a much more reasonable option than it once might have.